Floating and sun-drunk, She Went To Japan meanders effortlessly through a quadripartite of conspicuous tracks. The EP digs in early with woozy and haunting melodies in the title track “She Went To Japan”. “ANNNA-LIZZZA” breaks away with faster instrumentals and vocals, starting off downright grimy. The singer howls into some off-screen chasm, never pausing for the echo. Penultimately, “Bright Light in The Castle” tightens up rhythmically while belching screeches and scratches over airy, omnipresent vocals. “Heavenly Load (Silver Halide)” decrescendos into a lo-fi amalgamation of the previous three songs, stylishly ending on what sounds like carousel music played in reverse. It’s pretty far out. 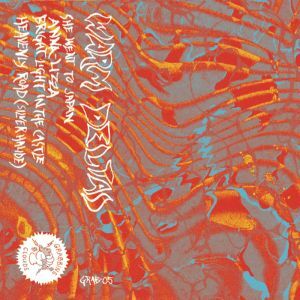 For the perfect vibe on a hot day, dive into the Warm Deltas’ She Went To Japan and don’t forget to snag the cassette from Grabbing Clouds now! BUY the cassette from Grabbing Clouds via Bandcamp – limited to 50 pieces ! Posted on July 25, 2014 July 25, 2014 by cthomas81Posted in Cassettes, EP, ReviewsTagged dream pop, Grabbing Clouds Records and Tapes, pop, psychedelic, She Went To Japan, Warm Deltas.